Somehow it's the middle of March and I haven't posted any of my sewing so far this year! 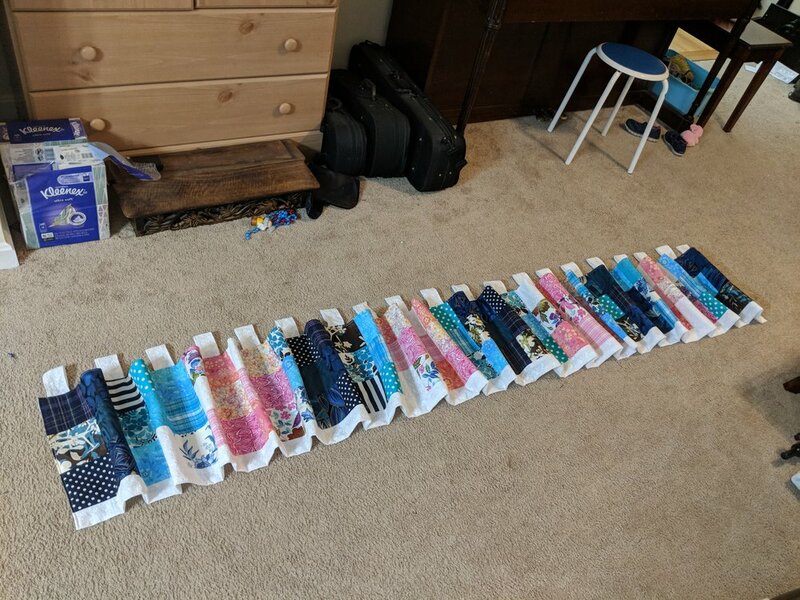 When I look back at my projects, most of my January sewing was curtains, so this post will concentrate on that. Decorating does not come naturally me, and since I have moved here, I've spent a lot more time on Pinterest than I ever did before. I knew that I would most likely end up making my own curtains, but I spent time searching for ready-made curtains as well as sourcing fabric so I could pick the most cost efficient option. I read something on a blog that resonated with me. Basically it was, "if you're going to pay for custom curtains, they need to be something you can't find in stores." 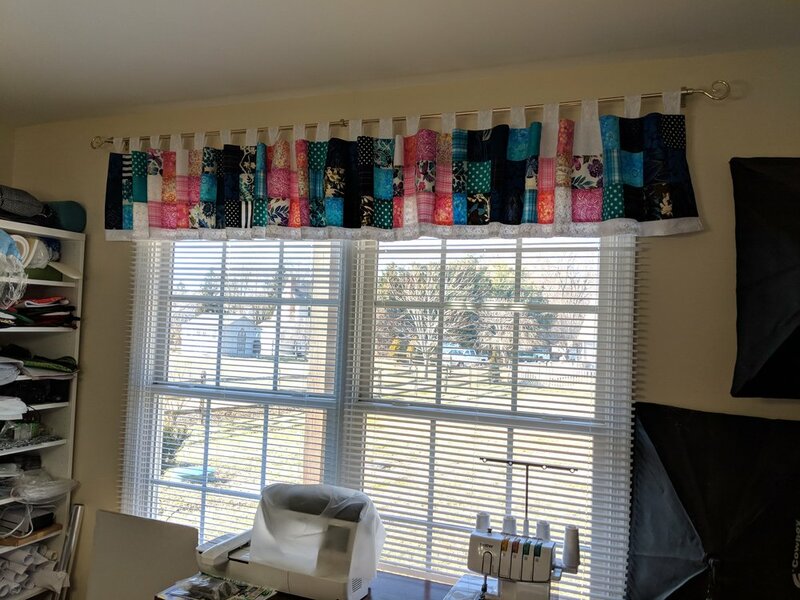 I decided that if I'm going to make curtains, it needs to be because they are something special, something more than run-of-the-mill panels and valances. Even if I can save money making a panel, curtains take time, so when I can purchase them, I will. I have plans to purchase curtains for my husband's office and for our upstairs balcony. My original plans for my sewing room were to just buy a pretty fabric and make a simple valance. But inspiration hit and suddenly I needed to make a scrap valance, and I couldn't get anything else done until I finished that! 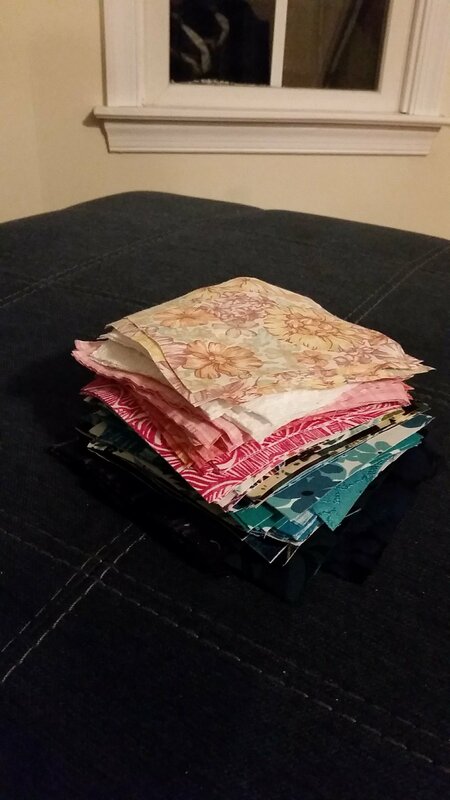 First I got out my various woven scraps and picked some fabrics. I noticed that I leaned towards pink and blue, so I picked as many of those fabrics as I could find. I did the math on how many I would need, and spent one evening setting them all out. The sewing didn't take too long, and then I chose to add a little white band on the bottom to match the loops. I'm so happy with the result! It really brightens up my sewing area, which is attached to the living room, so I see it all day and it makes me happy. Next I decided to address the two little windows on either side of our front door. I wanted to let light in, so sheers were the way to go, but I also didn't want plain white. Now here is where I didn't follow my own curtain philosophy--I made something that I could have bought. However, I wanted to try out this linen-texture voile from Fabric Wholesale Direct. It comes in 110" wide per yard, which makes it super affordable when making floor length curtains! I only needed one yard to make both curtains for this window. I bought magnetic curtain rods. First, I miscalculated the height, so the first curtain was too short. I was so upset! I added some height to the second one and could tell that it would look much better, so I got out my seam ripper and fixed the first one. You can see the difference in the photos. I love these now! They never fall off, but they do sometimes get shifted if a kid bumps the rod. It's easy to fix though. The biggest project was family room curtains. I knew I wanted some long panels and a bay window curtain rod, but I didn't know exactly what I wanted until I saw this eyelet fabric from Fabric Wholesale Direct. I got a swatch and determined that it would coordinate with our blue couches. I decided to make the panels with eyelet on both the top and bottom. After consulting my Pinterest board of curtains, I decided to make pinch pleats at the top. These were several days of work! I used the white voile, a different color of the same fabric as for my front door windows. One thing I wish I had done was measure better. After I made them, I decided to not fold the top over like planned because it would be too thick. That made them about four inches longer, and I estimated they would still be okay. I hemmed them an extra inch. Well, when we hung them, they were too long, and so I had to hem them more. It makes the bottom panel of eyelet not as wide as I wanted, and that sometimes still bugs me. But in general I love them! These projects were all curtains I could make without having to paint first. Most of the other rooms require paint. My son's room is already painted and I finally decided on some fabric for that, so I hope to complete his valance soon. As for home decorating, I have another big project coming up, which will be floor pillows for the family room. My sister made some stuffed ones that I really like, but I'll be making them with foam and making them so they stack up and can be zipped into a cover to make an ottoman.